Photograph could be that have been displayed in other contests or that have been entered to the other contests currently underway. Photograph that have won prizes in other contests is also eligible. Entry is limited to the photograph that the entrant takes and holds all applicable rights. The organizer reserves the right to disallow entries that depict copyright, rights of persons, brand logos or other intellectual property in any type of forms. Entrants are responsible for the resolution of any legal issues arising from their photograph and agree to pay any costs thereby incurred. Copyright of the photograph and Organizer’s Rights of use. Although entrants retain the copyright, the organizer retains the rights of use. Photograph could be used in the cases below. 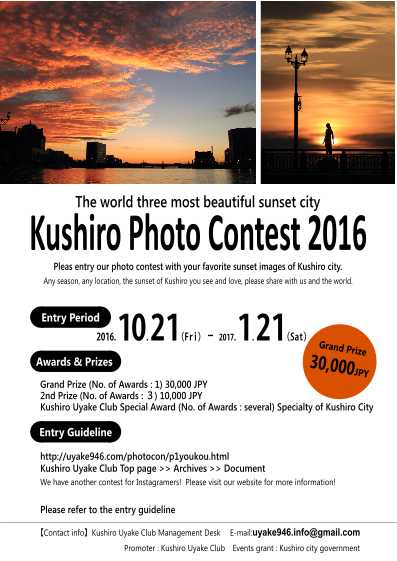 Kushiro Uyake Club reserves the right to publish all entries onto websites, social networking services and the other types of media formats. Such publication does not guarantee an award of any kind. 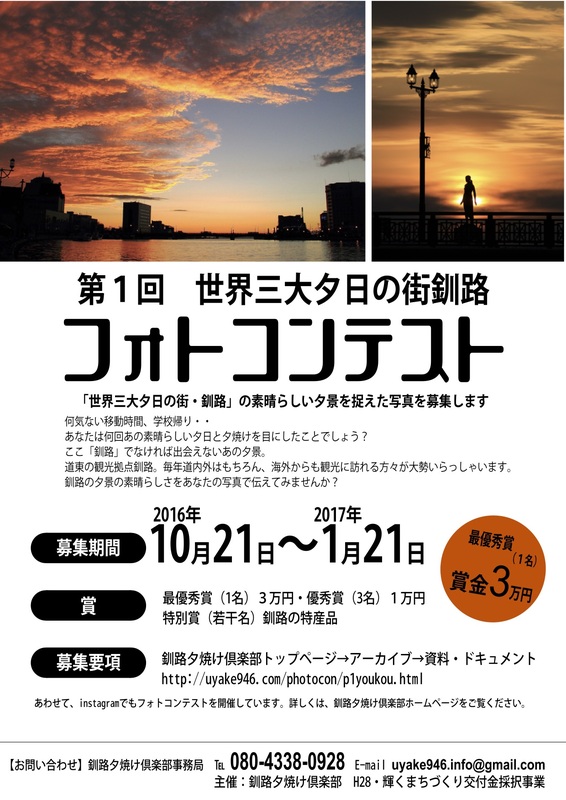 Associated organizations, companies, groups of the members of Kushiro Uyake club receives the right to publish any types of publications and medias for usage of public relations, except commercial use e.g. newspapers, magazine, posters, etc. There is no limits on numbers of submitting photos per an entrant. Enter the contest by providing the required information in the entry forms next page then post with photograph. Please note that the organizer may elect to postpone the contest due to circumstances of any kind. The provided personal information will be used for pertaining to the contest, the names of the winners will appear with the winning entries. should you prefer using your ’pen-name’ for photograph. please refer below. We have another contest for Instagramers! Please visit our website for more information!